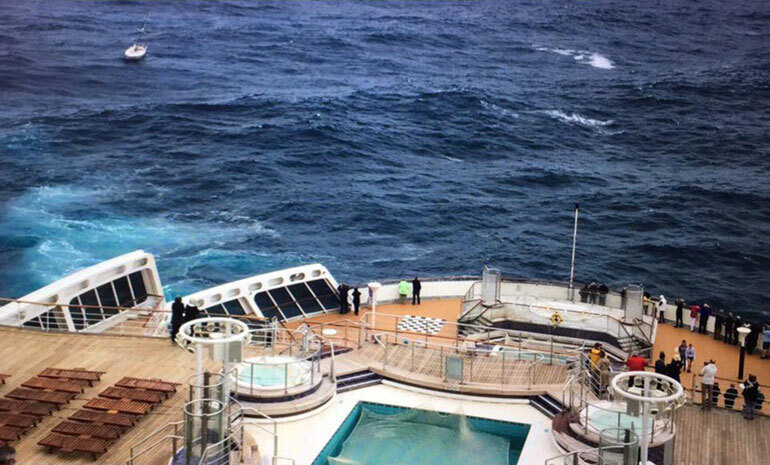 A cruise ship has been involved in a major rescue operation where multiple yachts needed help. Queen Mary 2 which is among the largest cruise ships in the world and operated by British-based Cunard Line was involved in a major rescue operation in the middle of the Atlantic Ocean on Friday, June 9. Multiple sailing vessels were hit by major Hurricane force winds of up to 70kt along with 10-15 meter high waves. The small boats were damaged with one being dismasted and the others suffering from hull or rigging issues. Once the alarm was raised of the stranded yachts Canadian authorities launched a major rescue operation by sea and air. Not just Queen Mary 2 but other shipping vessels in the region came to the rescue with a merchant ship arriving on the scene first which rescued 2 sailors. Sea conditions continued to be bad and 2 large cargo vessels needed to keep their distance in fear of hitting the smaller boats. With the stranded sailing boats spread out across over 150 miles the Queen Mary 2 set course for one of the sail boats and rescued the sailors. One of the yachts managed to make its way out of the storm area but another one declared an emergency and was taking on water. The yachts were taking part in a transatlantic race which started from Plymouth, UK and ending in Newport, Rhode Island. They probably didn’t expect to be caught in the bad weather conditions which involved multiple assets and a major rescue operation. We are glad to report that everyone was finally rescued and now safe. The multiple rescue operations took place around 900 miles off Newfoundland, Canada in the mid-Atlantic Ocean. Queen Mary 2 was in the middle of sailing a transatlantic voyage which departed Southampton, UK on June 7. The 150,000 gross ton vessel is scheduled to arrive at Cape Liberty, New York on June 15.